The yield on the benchmark 10-year Treasury note fell to its lowest level since January 2018 on Thursday, a day after the Federal Reserve held interest rates steady and suggested it will keep rates the same for the rest of the year. The Fed also downgraded its economic forecast for the U.S. economy and said it plans to end its program of reducing the bonds and mortgage-backed securities it holds on its balance sheet. Investors viewed the move — and subsequent comments from Chair Jerome Powell — as more restrained than expected. The 10-year yield held lower at 2.519 percent after sinking 8 basis points in the prior session, while the yield on the 30-year Treasury bond was also lower at 2.957 percent. The yield on the 3-month Treasury bill, more sensitive to changes in Fed policy, was up at 2.478 percent, higher than the rate of return on both the 2-year Treasury note and the 5-year Treasury note. The two-day move in Treasury yields signals both just how much inflation expectations have receded and how the Fed’s thinking on their 2 percent average inflation goal has changed in recent months. The more temperate Fed outlook sent Treasury yields, which fall as bond prices rise, plummeting to multiyear lows Wednesday afternoon. The motion exacerbated the flattening of the so-called Treasury yield curve, the plot of interest rates at a set point in time of bonds having equal credit quality but differing maturity dates. Under normal conditions, the yield curve slopes upward: those that agree to take an IOU from the U.S. government for years are compensated with higher interest rates than those who agree to loan money for a just a few months. This can change, however, when market expectations for economic growth decline. If investors believe that the U.S. economy will produce fewer goods and services in three years than it will in three months, for example, the curve can invert, or slope downward. That rise of short-term yields above longer-term yields is often viewed as a recession predictor, though technical analysts view inversion of certain sections of the curve as more critical than others. The 2-year Treasury yield first rose above the 5-year Treasury yield on December 3 and remains at its flattest level since May 2007. However, many market participants have long heralded the spread between the 2-year yield and the 10-year yield as the more important difference. That curve remains upward sloping, though at a flat 11 basis points. Still others, like White House economic advisor Larry Kudlow, look to a different segment of the curve. Last year, he told CNBC that both he and the New York Federal Reserve view the spread between the 3-month Treasury yield and the 10-year yield as most important. The spread between the 3-month yield and the 10-year yield is now at 4 basis points; the spread between the 3-month yield and 5-year yield is already inverted. The new comments on Wednesday came just months after central bankers suggested that two hikes to the overnight lending rate could be appropriate in 2019. The Fed’s committee hiked the overnight lending rate four times in 2018; it is currently in a range between 225 and 250 basis points. Labels: Bond Yields Report, CNBC. 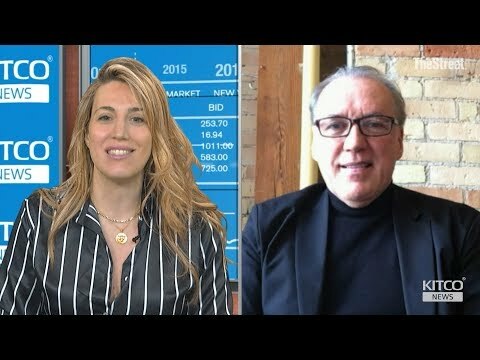 Kitco News Video | Frank Holmnes: Corrections Are "A Buyer's Opportunity"